This diamond in the rough is a must see! 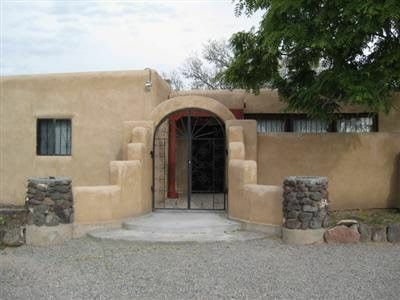 This 3-bedroom, cozy, adobe, custom built home sits on 3.21 acres 1/2 mile from Esp. Valley HS. It also features a living/family room, kitchen, dining room, sun room, 1 full bath, laundry room, & detached workshop AND tool shed in back yard. It is both private & secure because it is gated, has fenced front & back yards (coyote fences), a front walled patio, a back covered patio, & wrought iron on windows. Flagstone floor in LR, brand new carpet in bedrooms & brand new tile throughout remaining areas. Pellet stoves in living room & sun room; energy efficient, electric baseboard heaters in bedrooms. Recently painted; two-car carport (end-to-end); private well & septic; & shade trees. Entire property is quiet titled. Minutes from US84/285 & major shopping centers & businesses. Directions: Travel north on US 84/285 through the town of Espanola. Turn right onto to Fairview Lane at stop light. Go straight through 4-way stop at McCurdy Road. Turn left onto El Llano Rd. at next stop sign. Travel for 1/2 mile, property is on right.